This is a great spring class to learn how to quickly paint loose, impressionist flowers with transparent watercolor. The designs are simple and easy to do, even for beginners. The student will finish 4X6 paintings and assemble them into 3 cards suitable for Easter, Mother’ Day, or other occasions. The 3 cards include envelopes. The techniques students learn are painting shapes of common flowers and leaves, brush strokes for petal and leaf shapes, wet-in-wet painting technique, color mixing and composition. All supplies included as well as a handout of instructions. This class is good practice for watercolor painters who want to paint looser. 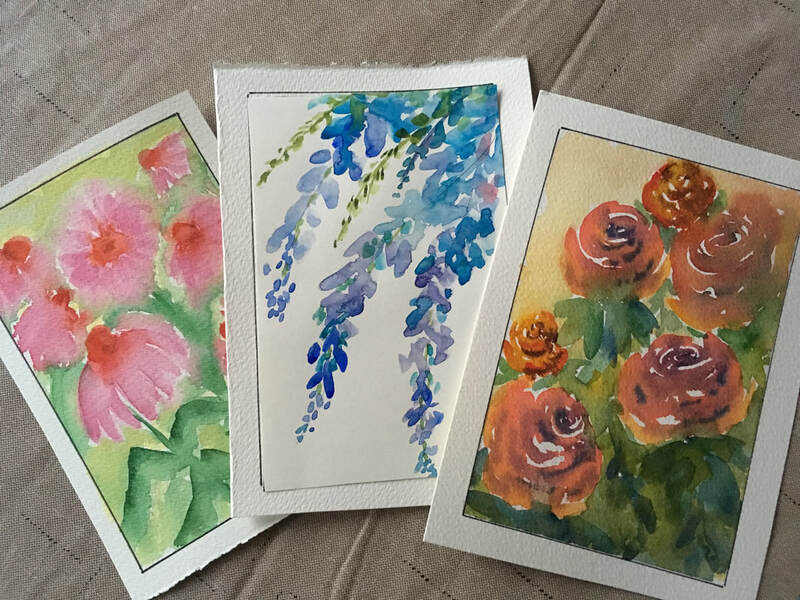 Since retiring from her Nurse Practitioner career and moving to the Georgia Mountains, Joyce now shares her enthusiasm for painting and crafts by offering group and private classes. Her classes are designed to be fun and easy for beginners, as you learn basic techniques. She strives to inspire students to continue painting and to enjoy the creative process by being fearless and playful. Joyce is a landscape watercolor artist who loves to paint outdoors. She leads a local plein air painting group including artists of all media. Joyce paints with a representational impressionist style using transparent watercolors. Her works may be seen at ArtWorks Gallery in Hiawassee, the Murphy Art Center, and the Blue Ridge Mountains Arts Association. Classes are held at these locations also. Painting with alcohol inks and rag rug weaving are additional creative pursuits Joyce enjoys. She applies colorful ink to a variety of surfaces such as Yupo paper, ceramic tile, glass, and silk. Her “evening craft” is up cycling fabric into mats and rugs using a method called “twinning” on a loom frame. Visit her Facebook page “Joyce Clair Art” for notices of upcoming classes and plein air painting outings. Joyce has been painting watercolors for 30 years. She first took drawing and photography classes at the Corcoran School of Art, Washington, D.C. Then she began weekly watercolor classes for two years with Dr. Morris Green, Maryland College of Art & Design. Joyce attended workshops with well-known watercolor artists Frank Webb, Zoltan Szabo, Skip Lawrence, and Tom Lynch. Her watercolor works are influenced by the watercolor master, Ed Whitney (1891-1987).